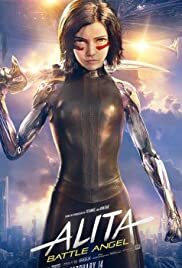 Not really looking forward to this Hollywood extravaganza, ALITA:BATTLE ANGEL turns out not too bad, aided by its awesome looking futuristic setting of a junkyard metropolis after a devastated War. The city looks like an overcrowded India with Zalem another city hanging over it. The film is based on a manga graphic series which usually spells trouble in the narrative department. But the script is written by no less than AVATAR helmer James Cameron with Laeta Kalogridis blending in some action and romance to bring in females into the target audience in what is essentially a male movie despite its female protagonist. The film’s setting is the year 2562 after a huge war referred to as ‘the fall’ has destroyed Earth. All the inhabitants of the planet has settled into Iron City. At the film’s start, Cyborg scientist Dr. Dyson Ido (Oscar Winner Christoph Waltz) discovers a disembodied female cyborg with a fully intact human brain. Ido rebuilds the cyborg and names her Alita (Rosa Salazar) complete with doll face looking a bit like Cameron’s AVATAR creatures). As the film progresses, Alita and the audience learn more of what’s happened to Earth. Warrior hunters are brought in. Ido is revealed to be one of them. Alita falls in love with a human named Hugo. Hugo has the dream of entering the sky city of Zalem, that stands like a kind of Utopian heaven. There is also a violent game of motorball (reminiscent of ROLLERBALL) that Alita has some talent for. 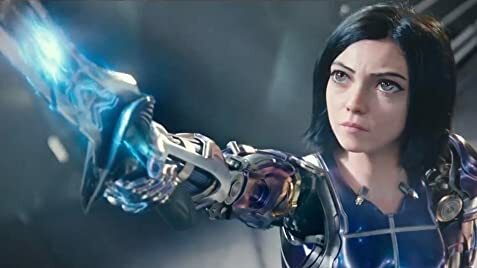 Alita also discovers her past and her exceptional fighting capabilities..The story’s villains are Vector and Nova played by Mahershala Ali and Edward Norton respectively, each taking their role tongue-in-cheek as if not to laugh uncontrollably. Christoph Watlz gets a break from playing a baddie, which one would think must’ve pleased him. At theToronto International Film Festival press conference for DOWNSIZING, Waltz was questioned by a journalist if he faced a problem with all those baddie roles. Waltz was visibly upset and replied maybe that was the journalist’s problem. Waltz plays the role of an eccentric father this time around. Jennifer Connolly plays his sympathetic ex, Shiren. The story is nothing special, understandable since it is based on a manga graphic novel. What makes up for it is the well orchestrated fight scenes and the motor ball sports matches even though it looks as if they were taken right out of ROLLERBALL. The climax includes a segment where Alita and Hugo are on a gigantic tube that connects Iron City to the high city Zalem. Hugo climbs the tune up to Zalem. It is a spectacular sight (looking more spectacular if viewed in 3-D IMAX, high I was fortunate enough to see the film in). One really ridiculous looking scene has Alita holding Hugo’s hand as he hangs for dear life after falling. Trouble is that only his torso is left, as he was repaired as a cyborg. Seeing Alita trying to save a torso looks really funny though that cliff having suspenseful scene was taken quite seriously by the audience at the screening I attended. ALITA ends up not the best of Rodriguez and Cameron’s efforts but still an entertaining one for all the corny manga story is worth. DOWNSIZING marks filmmaker Alexander Payne’s departure from real life and real life drama as witnessed in films like NEBRASKA, THE DESCENDANTS and ELECTION. DOWNSIZING is Payne at his most playful, a sci-fi adult fairy tale of sorts, but one in which real life drama still exists. The film stars Matt Damon who like the role in his last film George Clooney/Coen Brothers’ SURBUBICON is about a man who strives for a better life but things end getting more f***ed up. What a man will do to correct the situation is what SUBIRBICON and DOWNSIZING are about. It is interesting to see how two different filmmakers deal with a similar premise. 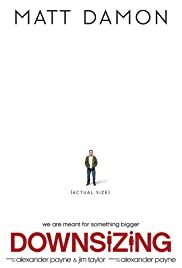 DOWNSIZING, a film combining several genres offers the solution to the world’s problem of overpopulation. If people can be reduced in size to a thousandth of their original, many of the world problems could be solved. People will only eat, use and dispose much, much less product. When science finally achieved the success of downsizing, many colonies were begun. So, Matt Damon and wife opt to be reduced and live in their new reduced size colony for monetary benefit. Things never go as expected. 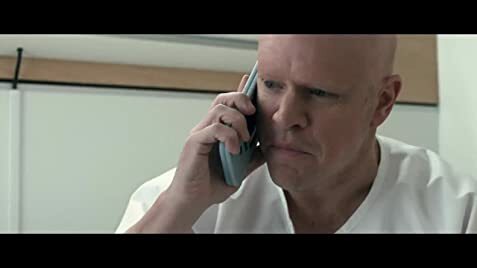 The film centres on Paul Safranek (Matt Damon) who is married to Audrey (Kristen Wiig) and who has spent most of his life working hard but still raying int he same old house. He figures that downsizing will allow him and his wife to afford the luxuries they would otherwise never achieve. But unknown to Paul, the problems he faces do not shrink like their bodies. After his is shrunk, Paul finds to his horror that Audrey has chickened out the procedure. Paul is left divorced in miniature Leisureland. DOWNSIZING’s script is brilliant with lots of attention to details. The film does not go into thriller territory but attempts more ambitious aims. Payne’s social satire is the most ambitious of all his films but it largely works thanks to the script. Damon’s performance is fantastic (even the glimmer fem his eyes) with help from a host of impressive stars (Kristen Wiig, Christoph Waltz, Hong Chau, Laura Dern, Jason Sudeikis and Neil Patrick Harris). The prize performance comes from Hong Chau, as observable in the scene where she convinces with happy tears, Paul and company the reason she has to visit Norway. Shot in Toronto and around the fiords of Norway. It’s frustrating. Even though I agree with all of you [other actors being interviewed], I have a less romantic and idealistic approach to acting. Over there [Germany], the business is based on mediocrity. On a high level, admittedly, but mediocrity. You reach a certain level, beyond which you will not go. Not just in career but in challenges and opportunity. It’s interesting for the specific issue of how to cope with an actor’s life. To lead an actor’s life. What do you do if you have a stretch of five years where you only get mediocre offers and nothing to sink your teeth into? That’s where it is difficult. Becoming an actor is one thing. Being an actor is entirely different.